I've been thinking about a small board to combine the GPS boards that have separate wires for GPS and Mag into one wire compatible with our serial ports the way the V9 GPS board is. Essentially a postage stamp sized board with 3 connectors, a STM32F031G6 cpu, crystal, vr, and a few caps. And maybe the ESD chips if there's room. Firmware would be a modified version of the V9 firmware. 1. I picked that cpu because it matches the specs in the existing V9 firmware source. I can't find a clear photo of the bottom of the V9, what cpu does it actually use? 2. I seem to remember (not that my memory is great) that the flash on the V9 was there for a future logger function that was never implemented. True? I was also thinking of trying to make a version that would fit inside the generic hockey puck gps like the one in https://forum.librepilot.org/index.php?topic=259.msg2471#msg2471 Remove both cables, hook a small board to where they were, and run the combined cable out. I think you can have a try, it's simple. @xfce Thanks for the encouragement. I am planning on doing it, mostly because doing a project is the best way I've found to get familiar with something. In this case it's to get familiar with the project's source code. Making a modified version of the firmware and getting it to run will force me to get better acquanted with the code. These days the hardware design is trivial compared to getting the firmware working. I ordered a STMF0 discovery kit to breadboard a prototype before my earlier post. DigiKey is pretty good about shipping, it'll probably be here Friday or Saturday. The GPS to go with it I ordered a few days ago but it's coming from China and will take longer to get here. It's the same one I linked to in the earlier post. Looking at his picture and knowing the size of the mag chip in it I estimate I can put around a 12x24mm board in there. That gps is a really odd design, all the power and signal wires lay on top of the mag chip. It's low power and current but I'd never have run those wires over a mag sensor. I had wondered if anyone had laid out an oplink with the 1 watt module, nice job. Did you make the larger board have the footprints for both the 100mw and 1w modules? I've considered this as well. I started researching using an Arduino. It would be great if you can develop anything like this! @TheOtherCliff I thought about a board based on an AVR or PIC processor but liked the idea of keeping it STM32 like the rest of the project. And a large part of my reason for doing it is to force myself to become familiar with the project's code. In the 43 years I've been programming I've found that the best way for me to learn something is to just jump in and do a project. I can get you all the info you need about the v9 when mine arrives tomorrow in the mail. @hwh I would definitely suggest that you start by building your own LP code. I bet you can do it in a day, but start with release 15.09 as 'next' is a bit in flux right now. That is the actual code running inside the V9 GPS. It is the code where an F10x processor is used to talk to a GPS and a mag and put it out on a single serial connection. The gpsplatinum code hasn't changed in a while now. Thanks @TheOtherCliff. I've already setup an account on bitbucket, forked LP into it, cloned it to my pc, installed the tools, and gotten next from the fork to compile. And I've looked at the stock gpsplatinum code and at least a little at much of the other project code. The STMF0 development boards should be here tomorrow and over the weekend I'll copy the v9 code to a new name, compile it, and try loading it on the dev board. Once I get that so it loads and runs I'll work on deleting the flash chip code and the other changes needed. @cato Yes, the V9 is a nice GPS. Even without the mag combiner it's a better design than any of the ones we can currently buy on eBay, Banggood, or other places. Using the ublox modules there are essentially two ways to connect them to the antenna, the cheap way and the better way. 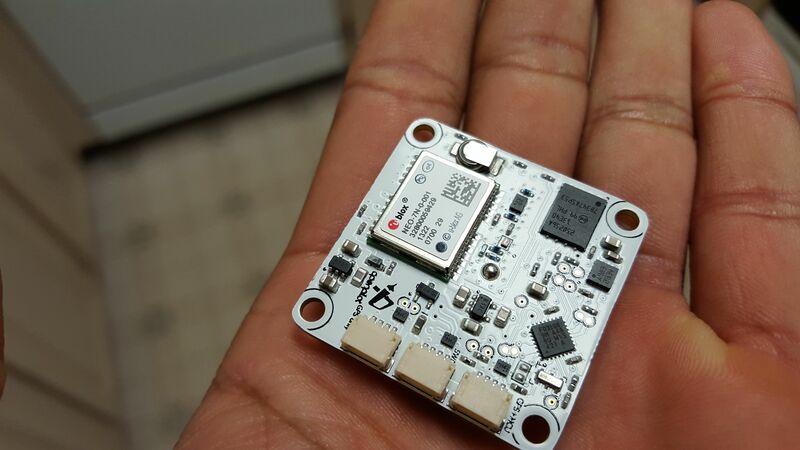 All the GPS I've seen available online use the cheap way, connect the antenna directly to the ublox module. The V9 used the better way, it put an external LNA and/or filter between the module and the antenna. I'm not sure which because none of the pictures I can find is clear enough to tell what the chip is. Either way, this makes it more sensitive and rejects interference from services on nearby frequencies like cell phones better. OP do you still need shots of the rear of the GPS? @JaeMelo I've gotten past the need for them but I'd still like to have them for future reference if you would post it. I wonder if there is a company out there that could somehow scan a bare pcb and generate a Gerber from it... Id totally do it to help get more v9's out there.